I love me a big time room reveal, the amount of work, decorating and all of the pictures get me all kinds of excited. But, I feel like a lot of times the smaller details are glossed over. 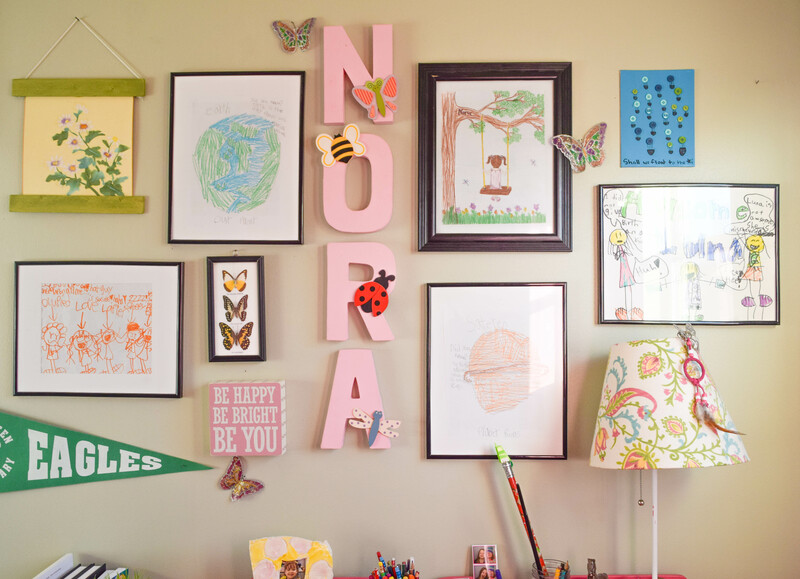 That is why I am going back into my daughter’s bedroom to share How to personalize a gallery wall for a kid’s space. I get a lot of questions in the comments of posts or emails from readers wanting specific details, products used or more in depth information. 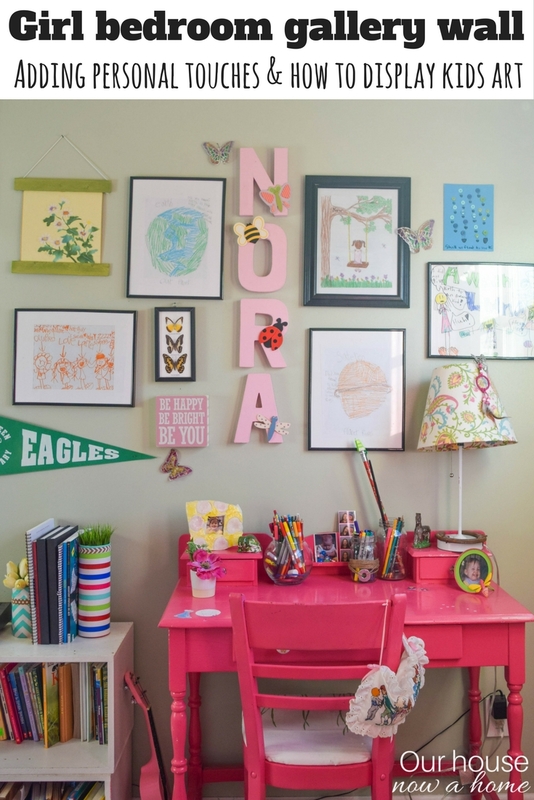 A room reveal post like I did with Nora’s bedroom reveal is long anyways. For me to explain every little detail would be a boring read for everyone. Like everyone else I adore gallery walls, I have one in my living room, my boys’ bedroom, as well as one in my hallway. Gallery walls are the best way to personalize a home. In fact I feel like having personal touches is what really makes a gallery wall successful. 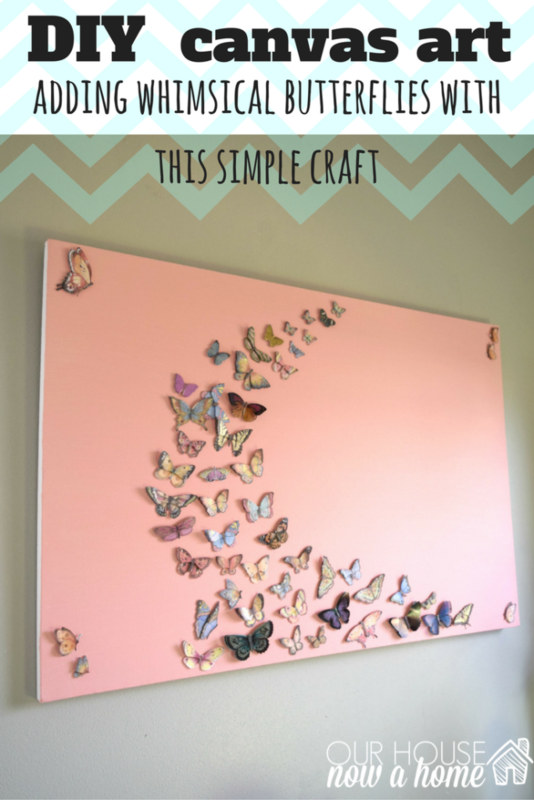 I have heard many people say that they are intimidated by the idea of putting a gallery wall together. I have a little system I use. 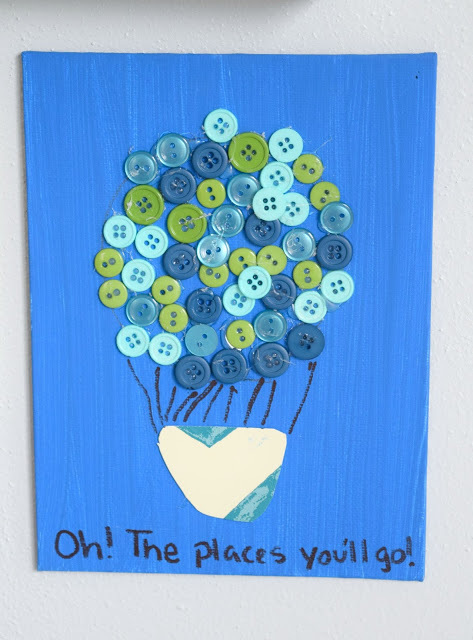 I compile all of the items I want hung up, getting a few pairs of items, matching sizes or coloring. Have some varying sizes as well. Then once all is selected, I measure out the space I have on the wall and mark that space on the ground. I start moving the items for the gallery wall around on the floor within the space. Once done take a picture just to you can reference it. Then start in the direct center of the wall with the items and move to the sides. I used some cute letters purchased from a craft store as the center focus to this gallery wall. I painted them pink and added the adorable bugs. I actually made these letters for each of the kids while I was pregnant with each of them. It was a cute tradition to have it above their cribs, I painted their names and daydreamed of what these tiny little people would be. Creating the gallery wall, building it up on the wall is really easy, no cutting or measuring paper to match the sizes, keep it all low maintenance. Another way I keep things low maintenance is with the storage on Nora’s desk. She is into drawing pictures and comic books. So having her art supplies at the ready for when inspiration strikes is important. 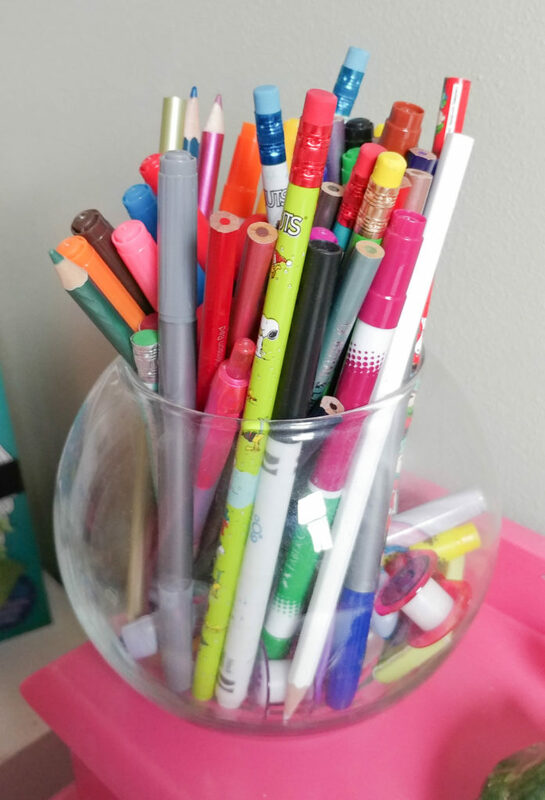 We do have the art table, but as my kids are getting older I can see them transitioning into just having a desk and art stuff in their bedrooms. Guys, my kids are not so little anymore!!! I am fine…. really… I am not crying, you’re crying! Here is Nora’s work. I love her comics and she enjoys making them so much. 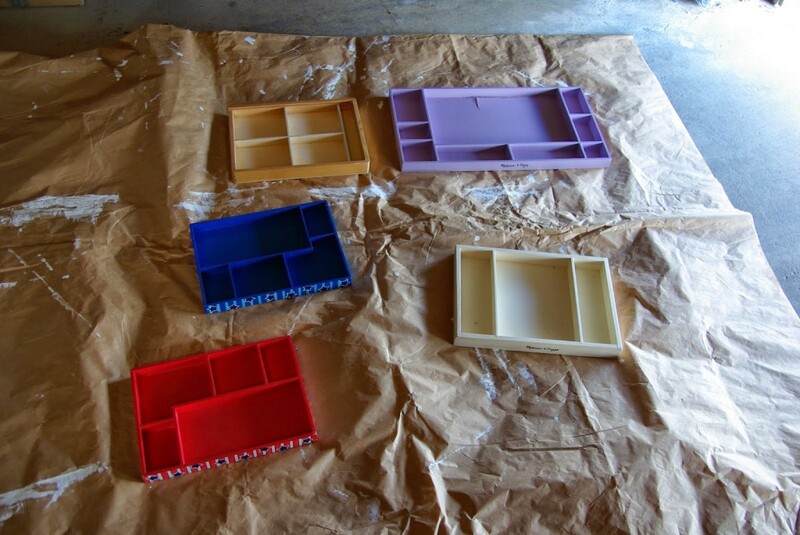 My super simple, zero hassle way to organize her art supplies is containers… so many containers. I use glass ones because she is really responsible and is older. But plastic ones, shoes boxes, or bins have been used when she was younger. If you want to get really fancy you can label the containers. With this being her room I like to keep things simple, and allow her to dictate what is in them. Labeling them would limit her being able to reorganize them however she wants. As much as I enjoy decorating my kid’s bedrooms I am transitioning them into decorating their bedrooms, encouraging that is their space. At this stage it is still a lot of me directing them. I do the trick of bringing up an idea and having it come off like it is their idea. I try to maintain organization, ease of use in their bedrooms and encouraging creativity. With kids sometimes all they think is that they want all-the-things. Having to hone in one what they need for their room is still my job. The way I have compromised in keeping things Mom approved but also what the kids want is gallery walls. They can pick what they want in them. A lot of times creating art projects for them, or selecting quote art from a store. I also incorporate their drawings. They way I make it Mom approved is by having it be organized, not just a pile of stuff taped on the wall. This is important because tape can make the paint peel and I am the one having the repaint. Also, it allows the pictures to actually be seen. My kids art may not be Picasso status, but it is wonderfully and perfectly them, I want them to be displayed to be enjoyed. So I pick simple frames for them to put their masterpieces in, but make sure the frames are really easy to open and change out. Another great idea for a gallery wall is to collect souvenirs. Every kid to ever exist when they go somewhere wants to buy something. When we go on vacation we visit a lot of museums in the new cities, and the gift shop calls to my kids like a moth to a flame. Having a gallery wall already established in their bedrooms allows for them to think of something unique and cool to get form these museum gift shops to add to their wall. It is a great way to remember the vacation, and we do not waste money on random stuff they will lose before we even check out of the hotel! 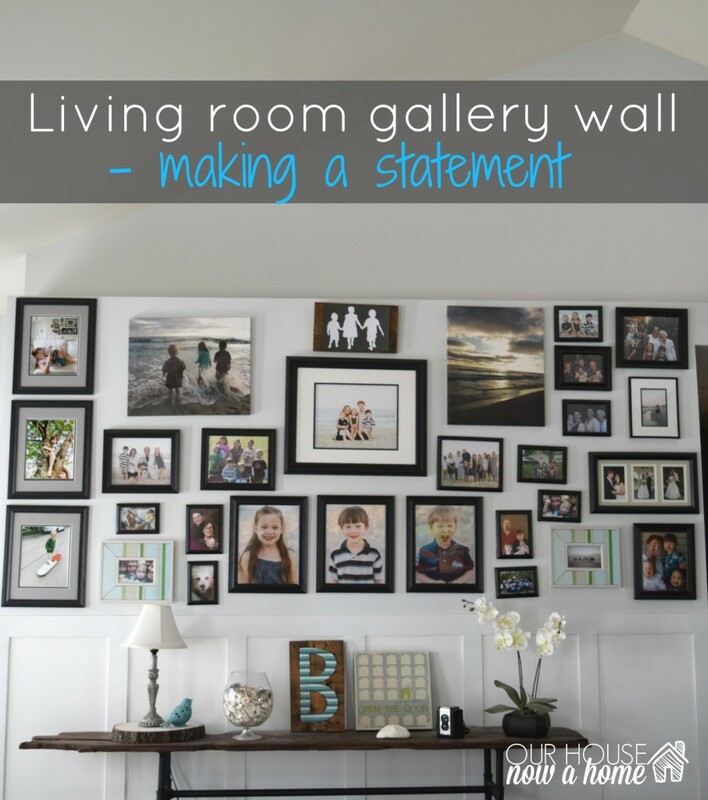 The one rule to always consider when creating a gallery wall… is there there is no rules. Sure, there are standard guidelines to consider – decorate to scale, don’t pick a bunch of big items for a small space. 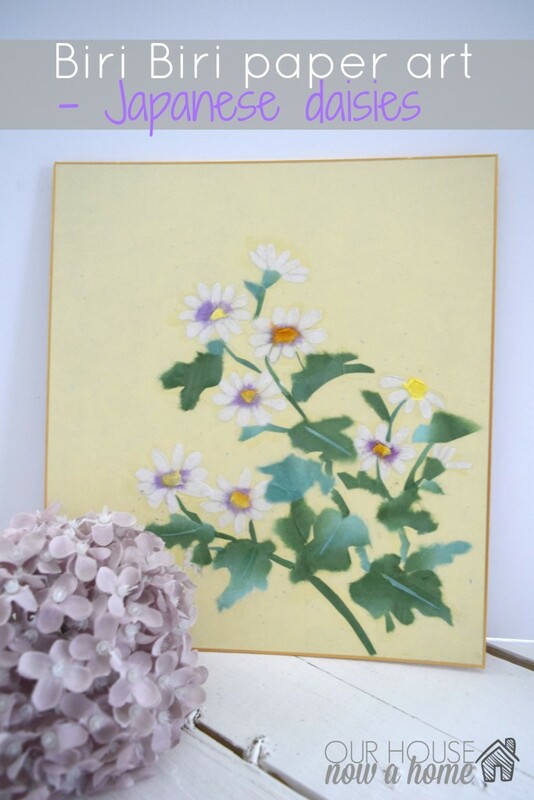 Or small wall decor for a big blank wall. Have a few pairs of decor, and try to keep each side even. But, when it comes down to it decorating your home is about what you want it to look like. With a child’s room the rules can be pout aside even more! Kids are great at breaking the rules, or ignoring them completely while they look you in the eye and break the rule. Aren’t kids fun? 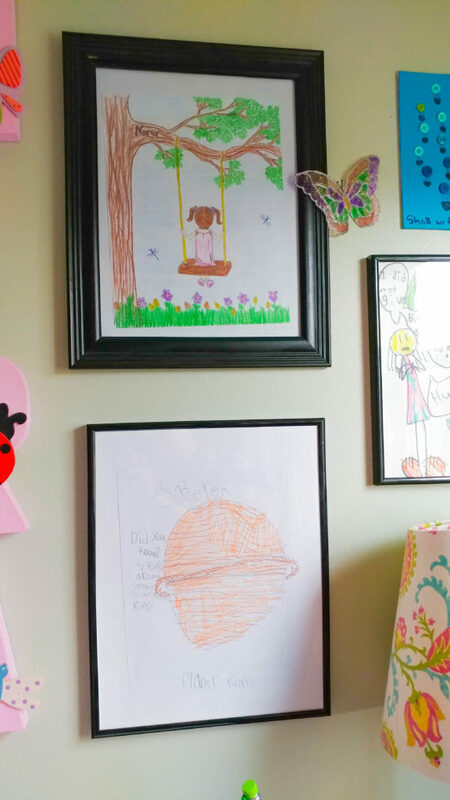 Create a kids gallery wall in the same frame of mind a kid would, add lots of color, so much fun stuff, throw in a few bugs and as much art work as you can squeeze into one space. Or that the refrigerator can spare. After all, that is the top of family home display places. When it comes down to it How to personalize a gallery wall for a kid’s space is done by letting them be the lead. Take their interests, their moments of fun, memories made, and their work to create the perfect wall. As far as making a spot for them to do homework or draw, a large bedroom or crazy DIY skills is not needed. 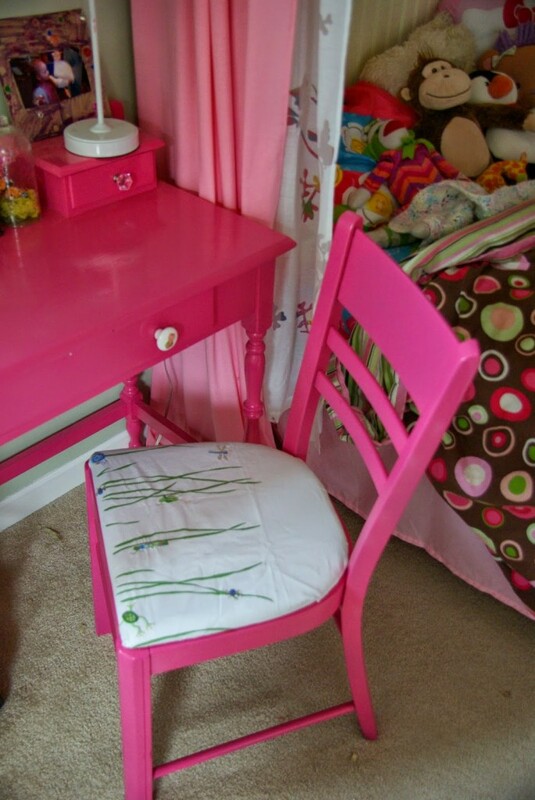 I used my old desk, painted the pinkest pink to ever exist (Nora requested) and a chair I found on the side of the road to match. Add in some containers for art supplies and the creativity domain is done! Of course with little tiny ones skipping the desk or homework area in the room and leaving it in the common areas of the home is easiest. That is what I had for years in our home, now that my kids are bigger we are moving things into their bedrooms more. Her having this quiet space to do homework, dream, color, and admire her work is really special for her. I think gallery walls are so cool! I never thought to put one in my kids room, but I like the idea of it. I will save this and send to my daughter. They are moving into a new home and she wants to redo the boys rooms. This wall of pictures would be perfect. Those pictures on the wall are so sweet. 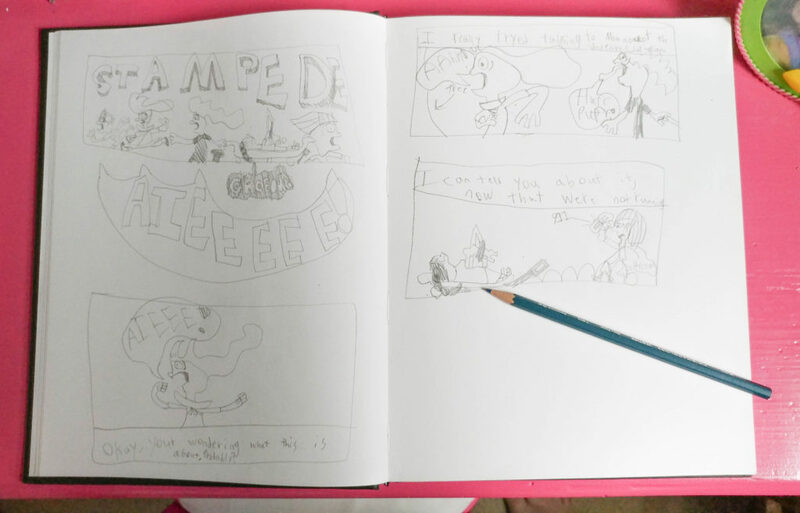 I was just looking over my daughters stuff that she has been designing and writing. Some of it makes me wonder what she was thinking. But other things just make me miss her being young. Beautiful. The room looks amazing and any little girl would love it. I am loving the nameplate on the wall. The room looks beautiful. I love the art you involved in making it more personalized. This is really awesome! I love the way it looks, and I especially love how you included her artwork in the gallery! I am definitely inspired to do this for my girls now! 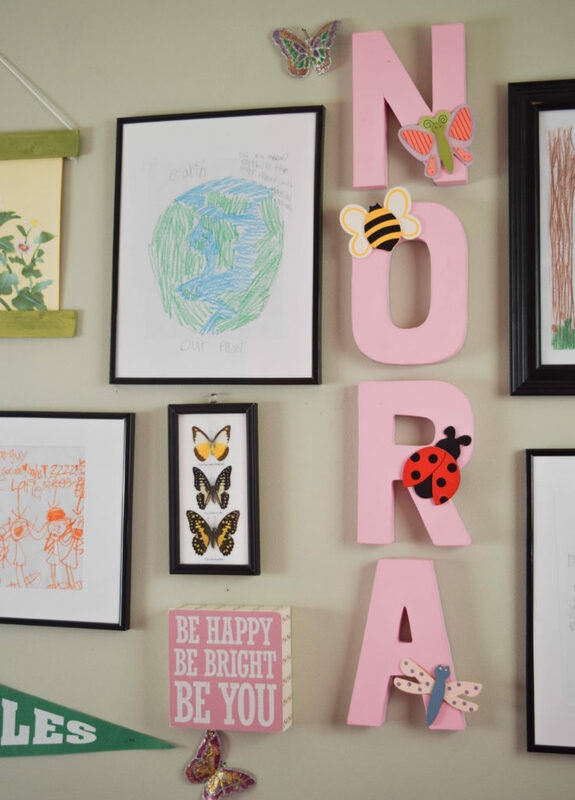 I love how you personalized Nora’s wall! I think it adds so much warmth to the room. I bet she loves it! What a great idea. I need to do this for my son’s artwork. This is really awesome. 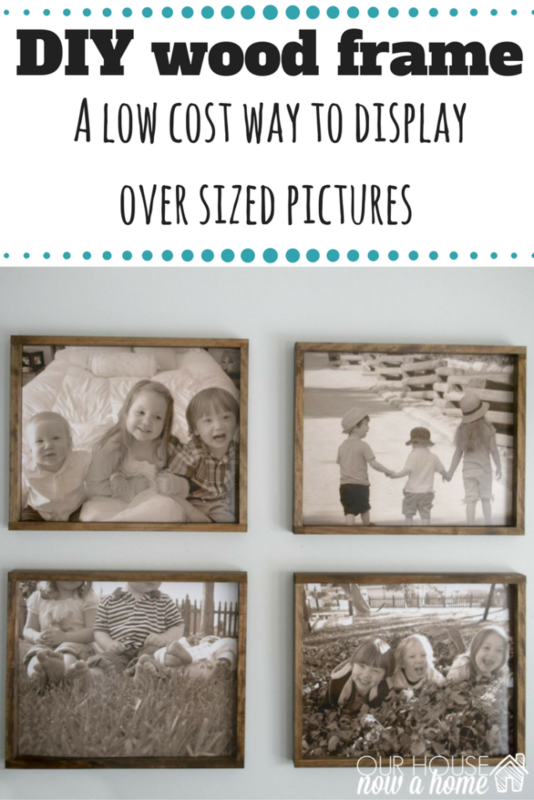 Decorate the walls with photos and create an interesting way to display them. i love gallery wall displays. I have a family photo gallery in my living room, but I have never done one in a kids room. I love your creativity. You have given me so many good ideas for displaying our grandson’s pics. .
Wow that wall looks really nice! This is something I’ve never really done. Using her own artwork was a great idea! I love this idea. We are in the process of remodeling my son’s room. I bet some of these ideas would work! That is such a cute idea! My daughter used to love drawing when she was little, but then her artistic streak took a turn to writing which she does a lot now! She’s an English Ed. major, so I guess that’s where she was supposed to end up. The pictures in this post are so cheerful I couldn’t help but smile! I always struggle with getting a gallery wall to have the right balance of elements and I think you’ve done a fabulous job with yours. Thanks for giving me some exciting new ideas! I love the pink desk. That is such a nice colorful room. I really appreciate the way that you springed up this room. so nice. I love your gallery wall. It’s such a fabulous way to personalize a space. Your kids room is gorgeous. Love this! I started a gallery wall and this is motivating me to finish it. Adorable and how fun. You did an amazing job on her room. Not sure I could pull this off. Ive never had a good eye for decorating, but I try. Love this and how the colors pop. 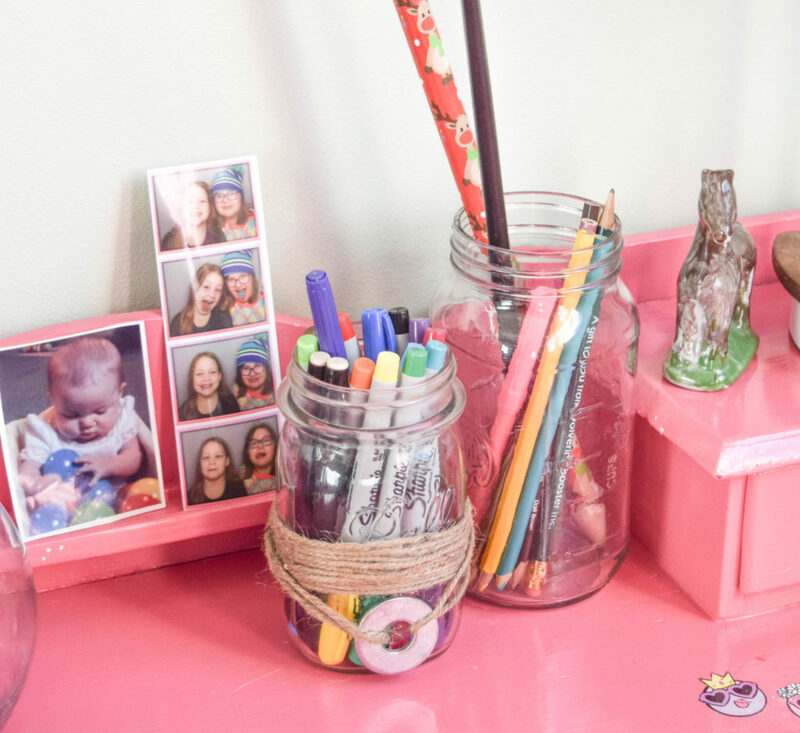 I need to redo my daughter’s room and I think this is a great idea. I love the way you did this! It can be so challenging to showcase kids’ artwork. You did a really beautiful job. I love the creativity and the simplicity of it all. The end result offers such a great use of space and organization. I love gallery walls. They always add so much to a room. This one turned out so cool and I love how personal it is! I love the gallery wall. All of my kids art work goes on the fridge then the garbage (bad mom I know). We are moving at the end of the month and I am totally going to take this idea for the walls in their bedroom and play room. What a great idea for a girls room! My tween would love to do this! Love this look. 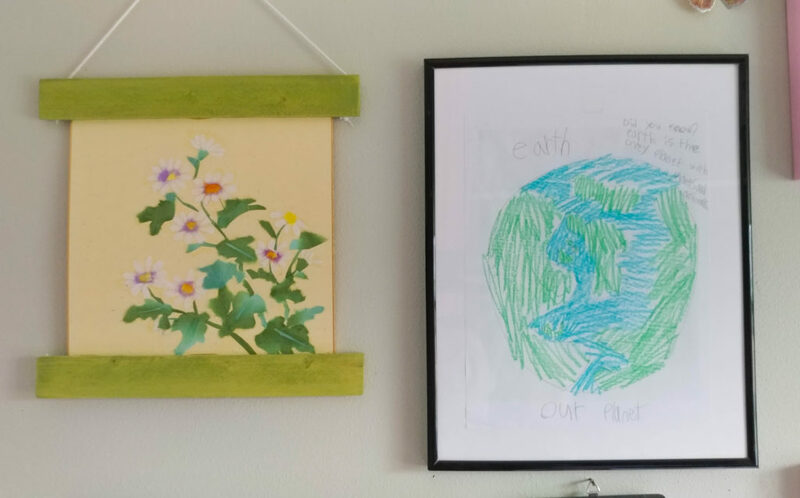 We framed some of our kids’ artwork but not this much. I still have a huge picture that my daughter made that I want to frame. (She’s 20 now). I absolutely love the drawings on the walls! I think it makes it more unique and more personal. It turned out so cute! I would make all my walls into a gallery if I could! We have lots of photos as a family that are really memorable ones and I would love to have them proudly displayed on my living room wall! 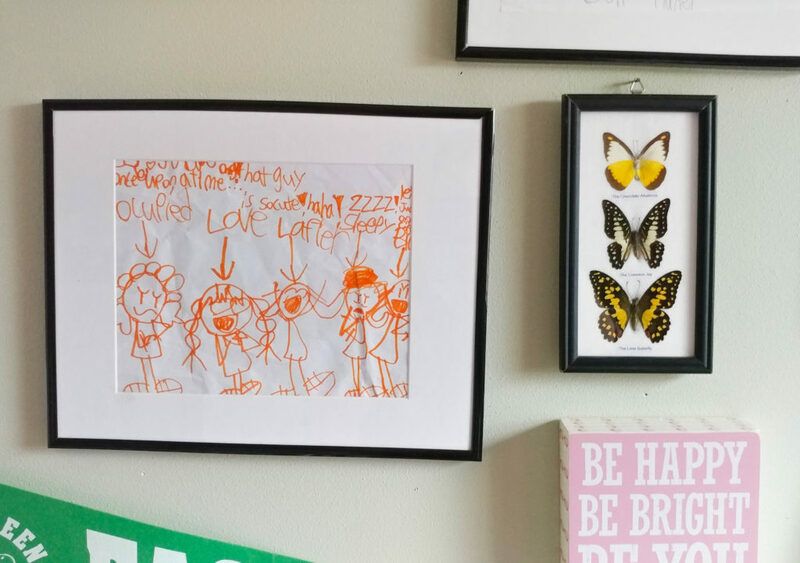 I think framing a child’s artwork is awesome too. I love love love this so much! 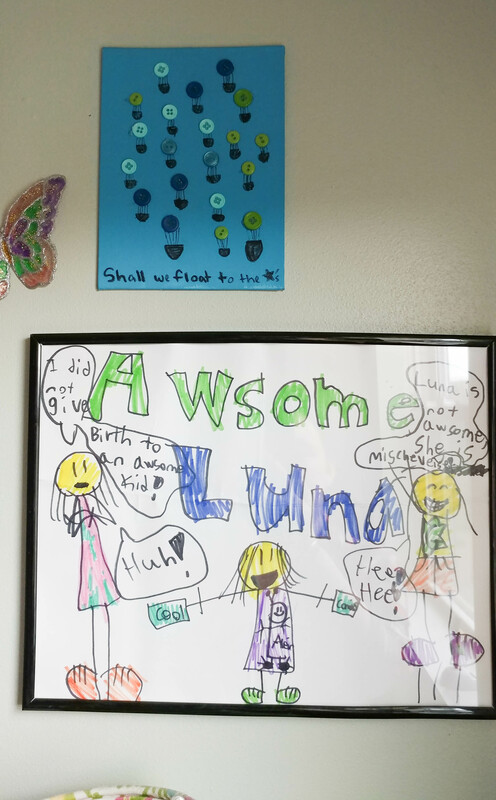 I’m trying to find ways to display my kids’ art in beautiful ways and this is exactly what I needed to see! Indeed a colorful design! I will be keeping this as a reference for my future kids. I love the idea that their own artworks are being displayed. 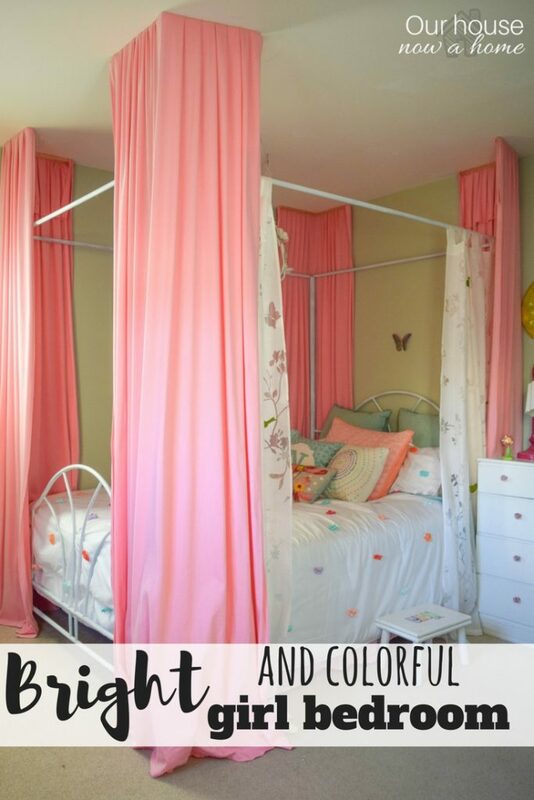 I love these ideas for my girls’ bedrooms. I need all the ideas I can get as we are still in the process of finding a new home. Wow! This is really awesome. It’s a nice idea for a kid’s corner or for your child’s bedroom. I also like the idea for the living room. 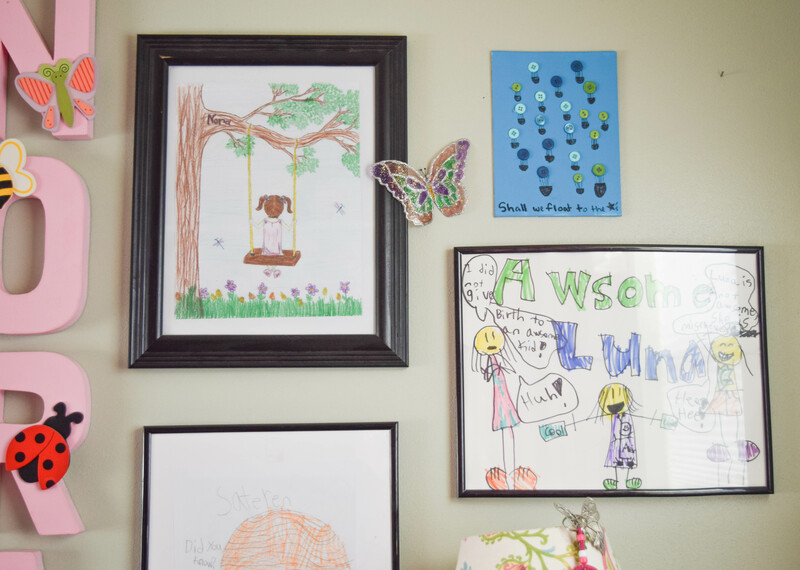 It would be nice to have a wall space that’s packed with the kids’ pictures! What a great way to commemorate memories we’ve shared. What a great idea for their rooms! My 6 year old would so love a wall like this in her room. I need to get to work. Love the way you have decorated your rooms with picture frames, letters etc. I will check out the black picture frame, looks very elegant! 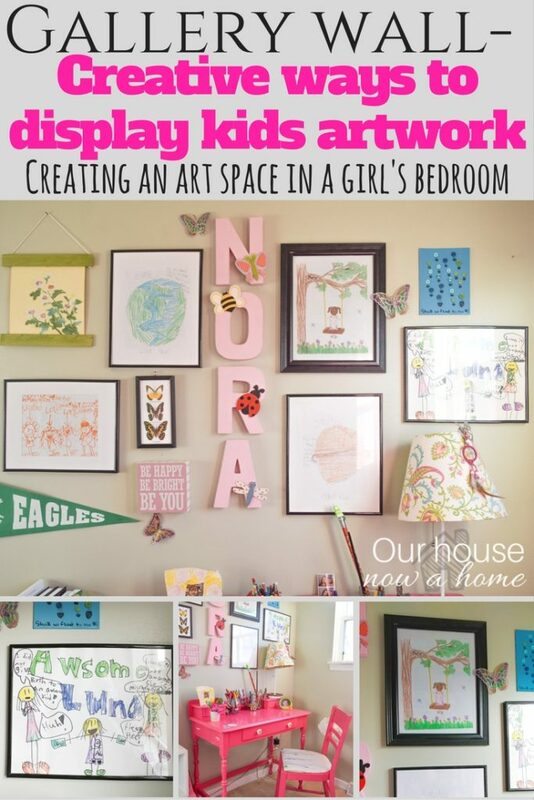 I really love the idea of creating a gallery wall in your kids’ bedrooms. I’m now thinking about incorporating one into my two littles rooms. You did a great job of breaking down how you do yours and make it sound really easy to do. This is a nice idea, which I’m sure my kids would be interested of. They also love DIY and they have a lot of drawing compilations which they can use. Looks wonderful! I love how it is so personalized and creative. Many kids would love to have this. I might try it out for my little one. What a cute gallery wall Emily! I love the idea of incorporating their custom art. My 3 year old would love having this in her room! Love how colorful this gallery wall is! It’s perfect for the room. And I totally agree about the long room reveal posts! Glad you pointed out these details. Wow, what a neat design I love this kind of bedroom and me really like the set up. I have been wanting to do a gallery wall in my house. This is so pretty for a girls room! We are going to be moving soon and I have been trying to find something like this. I want to do this in my kids room and then something similar in the hallway. I LOVE all the bright colors you used. 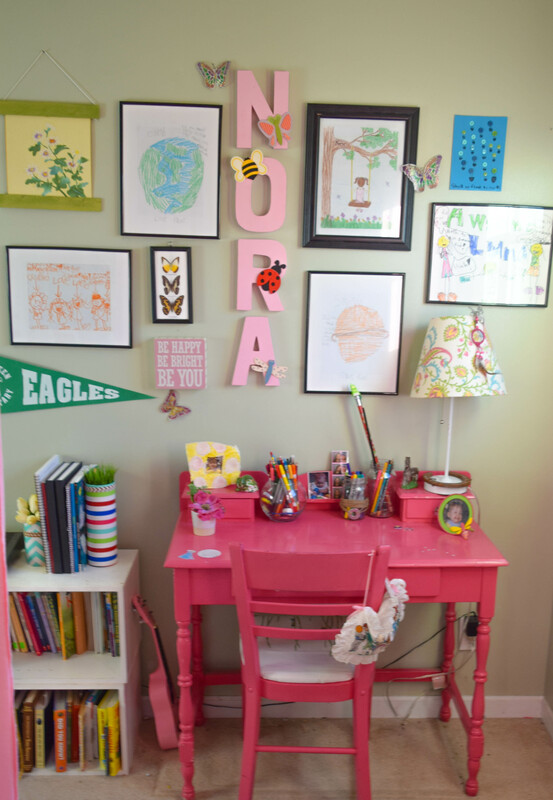 The gallery wall is fantastic, but the bright pink of that desk is a TOTAL WIN! This gallery wall is awesome!! Love all the personal touches. Your daughter must love it! !